The 6 bay shower hire, fitted with 6 private individual shower rooms with shower curtain, lockable, with a separate changing area to keep belongings and clothes dry and secure, a mirror, clothes hooks and seating. Each shower units are designed for efficiency and comfort. 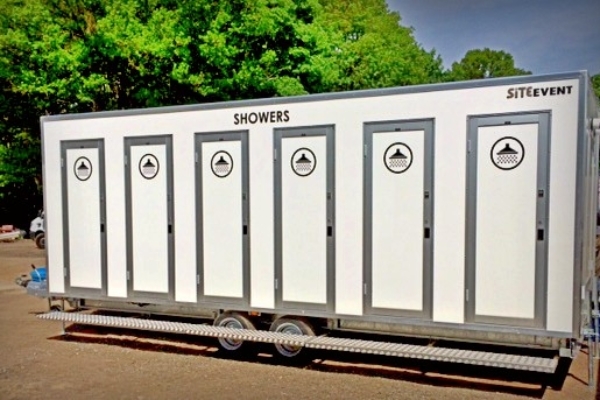 Our 6 bay showers can help to cut down queues at large volume events such as festivals, whilst giving users a hassle-free showering experience. The showers have pull out telescopic steps to ensure a quick and efficient delivery and set up, making the showers ready to use moments after arriving at your event. For your guest to enjoy a hot shower hire at your event the following services must be available; A 240v electric supply either from mains or via a generator, A fresh water supply from a hose pipe or an event water ring main, minimum pressure 1 bar, A soak away or authorised discharge point for the grey waste within 10m of the shower location and Propane gas 2 x 47kg bottles. Site Event can supply the following: A generator to supply 240v power via a 16amp extension lead, An IBC water tank to provide 250 gallons, 1000 litres of water if there is insufficient water pressure or a large demand is expected at your event, we can connect the site supply into the tank and into our on board water pump to increase the supply and maintain a good supply to the showers. Two x 47kg propane gas in a secure storage box on the front of the trailer, additional gas can be provided as required or on a supply or return basis, with test certificates (available on request). A grey waste tank of 300 or 500 gallon capacity which we can empty with our own tankers either during or at the end of the event. Pipework and installation to your mains services. A uniformed attendant to keep the showers in pristine condition. Out of hours emergency contact helpline. The 6 bay gas showers would be delivered either with our own 4×4 off road vehicles or on a delivery lorry and will therefore require enough room for manoeuvring and installation.